Streptococcus pneumoniae are found world wide within a variety of organisms such as: primates (like the wild Chimpanzee, Pan troglodytes) , some livestock (like pigs, Sus scofra domestica), and felines (Felis catus) (Saunders Comprehensive Veterinary Dictionary, 2007). They are considered part of the normal flora of upper respiratory bacteria in humans and are found in the highest concentrations among children, the elderly, and those with compromised immune systems (Center for Disease Control, 2013). Streptococcus pneumoniae can typically be found in the upper respiratory system however, the movement of Streptococcus pneumoniae most commonly causes conditions such as pneumonia, conditions such as pneumonia, bacteremia, and meningitis (Center for Disease Control, 2012, p. 234). Streptococcus pneumoniae are aerotolerant (can exist in an environment with O2) and features an anaerobic metabolism (therefore, it does not require O2). Streptococcus pneumoniae however, depends on the organism to provide catalase and peroxidase for its metabolism which is detailed further in the nutrition section. As these colonies age, the organism loses it’s ability to obtain catalyze and peroxidase because of its accumulation of hydrogen peroxide over time (Patterson, 1996). These organisms are typically diplococci (have two cells right next to each other) however, longer strands have been observed. They are also non-motile which means they depend on their host organism or other factors for transport (Todar, 2012, p. 1) . Figure 1. 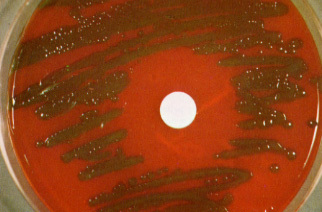 S. pneumoniae on a blood culture. 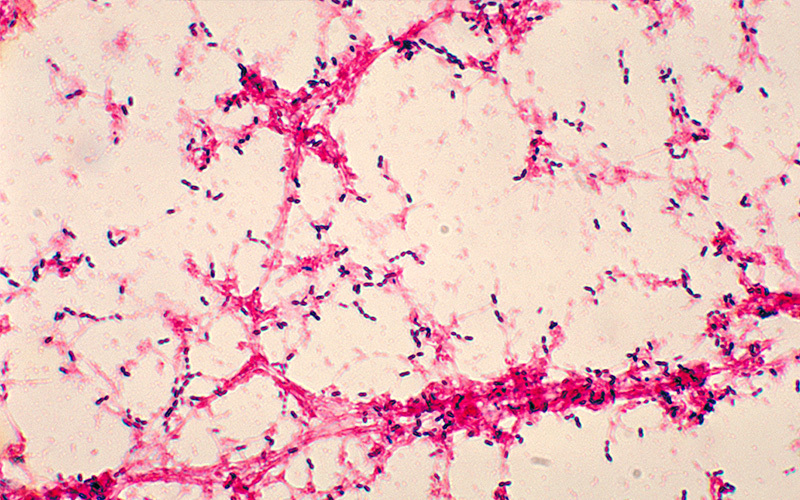 The small purple dots are are dyed purple because S. pneumoniae is a gram positive bacteria. Note how they usually are found in groups of two within the image. In vitro, Streptococcus pneumoniae grow best on blood agar as their metabolism requires blood to function properly. These organisms will grow the best when placed in an environment that offers a 5% CO2 concentration (Todar, 2012, p.1). On this media, Streptococcus pneumoniae will exhibit α-hemolysis (in comparison to β-hemolysis and Ɣ-hemolysis, which have different characteristics). This particular type of hemolysis produces a greenish tint on the media formed from incomplete hemolysis of the blood cells (Fox, 2010). Figure 2. Alpha hemolysis of blood media by Streptococcus pneumoniae. Used with permission from Dr. Kenneth Todar's Textbook of Bacteriology. Ex vitro, in an organism, this bacteria prefers the mucous membranes of the upper respiratory tract. It is estimated that anywhere from 5%-70% of healthy adults have Streptococcus pneumoniae living within their upper respiratory tracts (Center for Disease Control, 2012, p. 234). The human body in particular provides an a decent environment for this bacteria as it’s doubling rate is 20-30 minutes in mixed media containing blood that at 37 C (Todar, 2012, p. 1), which is that average body temperature for a human. Left unchecked this means that Streptococcus pneumoniae could theoretically produce almost 16,800,000 new bacteria within 24 hours!